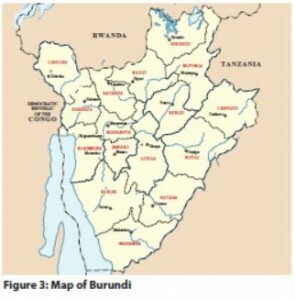 Burundi is a landlocked, resource-poor country with an underdeveloped manufacturing sector. The economy is predominately agricultural. Agriculture accounts for just over 30% of GDP and employs more than 90% of the population. 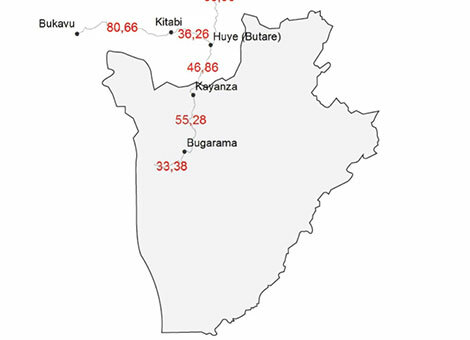 Burundi’s primary exports are coffee and tea, which accounts for 90% of the foreign exchange earnings, though exports are a relatively small share of GDP. Burundi’s export earnings – and its ability to pay for imports – rests primarily on weather conditions and international coffee and tea prices. A series of exogenous shocks (a rise in world oil and food prices and a decline in revenue) struck economic activity in 2013. Growth in GDP accelerated slightly from 4.2% in 2012 to 4.6% in 2013, inflation dropped from 18.2% to 7.8%, the fiscal deficit narrowed from 9.1% to 2% and the Burundian Franc (BIF) depreciated by 5% against the US dollar (USD) from January to December. The primary sector contracted by 2% in 2013, mainly due to the effects of rainfall on coffee production. The economy has slowly recovered over the past two years as services and the secondary sectors have expanded, the latter having benefited from investment in industry, construction and public works. Despite the tough economic climate, Burundi’s economic policy aims to provide the country with the necessary infrastructure and promote rapid, sustained growth in line with the strategic framework for growth and poverty reduction (Cadre stratégique de croissance et de lutte contre la pauvreté, CSLP II) adopted in February 2012. Major energy, transport, water, electricity and telecommunications projects began in 2013, and new programs were presented to technical and financial partners at industry conferences in July and October 2013.